Moroni 7 – Moroni wanted future generations to have the words his father taught the people concerning faith, hope and charity – so this chapter is like a transcript of a talk given by Mormon. “This shocked me because I was out about a thousand dollars. Well, I went on and paid the three installments I had promised to pay, and then I paid several more installments to convince the Lord that I had done it with the right attitude” (“Mother Eve, a Worthy Exemplar,” Relief Society Magazine, Feb. 1968, 84–85). “Wherefore, man could not act for himself save it should be that he was enticed by the one or the other” (2 Nephi 2:16). King Benjamin taught that the “the natural man is an enemy to God, and has been from the fall of Adam, and will be forever and ever, unless he yields to the enticings of the Holy Spirit” (Mosiah 3:19). 16 – “the Spirit of Christ is given to every man” What is the Spirit of Christ? Footnote 16a refers to is as “Conscience; God, Spirit of; Light of Christ.” The Light of Christ is basic, and given to everyone, but it invites us to progress and receive more and more light. The Light of Christ leads many to feel the Holy Ghost, and eventually receive the Gift of the Holy Ghost. The Holy Ghost testifies of Jesus Christ, who is our mediator and advocate, and Jesus wants to take us back to God the Father. Knowing that every single person on earth is blessed with the Light of Christ will help us approach all of our brothers and sisters with kindness and respect. We need to measure very carefully who our true friends are. The measure of a true friend is one who will not have us choose between his way and the Lord’s way. A true friend makes it easier for us to live the commandments of the Lord. A true friend will not let us do anything we want. True friends will correct us when we do something wrong and bring us back on the straight and narrow path that leads to exaltation. (“Return With Honor,” Ensign, June 1999). At the final judgment, do you think you will be standing alone? I don’t think so. Jesus, in numerous verses taught, “I am your advocate with the father” (D&C 110:4). Do you know what an advocate is? It’s like a lawyer – your lawyer. Someone who stands at your side and pleads your case! Imagine yourself standing in a court of law, about to be judged. How do you picture that? A huge desk that towers above you, a judge sitting with a gavel in his hand, and you standing all alone beneath the desk fearing and trembling? Imagine yourself in that position, then suddenly, your attorney, your representative, your advocate comes and stands by your side. Listen to him who is the advocate with the Father, who is pleading your cause before him— Saying: Father, behold the sufferings and death of him who did no sin, in whom thou wast well pleased; behold the blood of thy Son which was shed, the blood of him whom thou gavest that thyself might be glorified; Wherefore, Father, spare these my brethren that believe on my name, that they may come unto me and have everlasting life. (D&C 45:3-5). That’s a very different picture of the judgment than you might have imagined. There’s your Savior, your advocate, right by your side! We often talk about being on the Lord’s side, we sing, “Who’s on the Lord’s side who?” but these “advocate” scriptures show that the Lord is on our side! He is our defender, while Satan is called the accuser! (See Revelation 12:10). 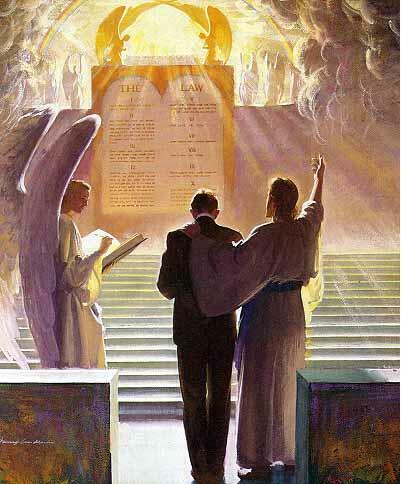 31 – “the office of their ministry” This is a wonderful verse which basically contains the job description of angels. What do angels do? Elder Jeffrey R. Holland spoke on this topic in October 2008 General Conference in a talk called “The Ministry of Angels.” (See also Hebrews 13:2, Alma 27:4). 44 – “if he have not charity he is nothing” The Apostle Paul gave a similarly powerful sermon on charity in 1 Corinthians 13 (notice footnote 44a). Paul said that even if you can speak “with the tongue of men and angels” and have not charity, you are as “tinkling symbol” or “sounding brass,” or in other words, you are nothing but meaningless noise. Charity is everything because without it we’re nothing. 45 – “charity … is kind” Quite a wonderful list! Amid all the carnage Mormon and Moroni experienced as the Nephites were destroyed, Mormon reminds us of this most important trait. I considered what was meant by the phrase “love of Christ.” That answer is critical because “the Lord God hath given a commandment that all men should have charity, which charity is love.” (2 Ne. 26:30.) If we must have charity, then we must know what it is. The phrase “love of Christ” might have meaning in three dimensions: 1. Love for Christ 2. Love from Christ. 3. Love like Christ (Ensign, November 1992, 29). 5 – “If I have learned the truth” Notice the careful language. Mormon allows for the possibility that what he heard through the Nephite grapevine might not be entirely accurate. We should be equally careful especially when we’re about to correct someone. 10-11 – “baptism unto those who are accountable and capable” Baptism is for the remission of sins, and in order to sin, you have to have enough knowledge and maturity to be accountable; if not, you would not be capable of sinning. James defines sin like this: “Therefore to him that knoweth to do good, and doeth it not, to him it is sin” (James 4:17). In other words, you must know what good is in order to do bad. As [Lehi] said, “Men are instructed sufficiently that they know good from evil.” (2 Ne. 2:5.) If we know good from evil and then sin (which, according to Paul, all men do), then we must talk about a second fall. This is not the fall of Adam. This is one’s own personal fall. This fall, which our own, not Adam’s, transgression brings about, requires redemption as surely as mankind needed redemption from the consequences of Adam’s fall. We’ll term this the “fall of me.” – Jesus Christ, Key to the Plan of Salvation, (Deseret Book, 1991), 95. No matter how wicked and ferocious and depraved the Lamanites might be (and they were that! ), no matter by how much they outnumbered the Nephites, darkly closing in on all sides, no matter how insidiously they spied and intrigued and infiltrated and hatched their diabolical plots and breathed their bloody threats and pushed their formidable preparations for all-out war, they were not the Nephite problem. They were merely kept there to remind the Nephites of their real problem, which was to walk uprightly before the Lord. (Since Cumorah, 339). 1 – “I write unto my brethren the Lamanites” The primary audience of the Book of Mormon has always been the Lamanites, “and also Jew and Gentile,” the secondary audience (see Title Page). The writers of the Book of Mormon were always most concerned about their Lamanite brethren. When Enos prayed, he asked the Lord to preserve the records that they might be “brought forth at some future day unto the Lamanites” (Enos 1:13). Here, Moroni again directs his comments to the Lamanites, even though they were trying to destroy him and any believers in Christ at the time. Remember the Lord’s mercy from Adam until now, and ponder it in your hearts – where would we read about how merciful God has been since the time of Adam? I suppose we would have to go to the Bible! Then, when we receive “these things,” (the Book of Mormon), we ask God if “these things” are not true. Once again we see that the Book of Mormon is a companion to, not a rival of, the Holy Bible. 4 – “receive these things” Perhaps “receiving” the Book of Mormon means more than just having a copy, much like we say “receive the Holy Ghost” to those who are being confirmed. That the Holy Ghost may be conferred upon us, it is true, but we must “receive” it. We hope our brothers and sisters will receive the Book of Mormon, and willfully suspend disbelief as they ask God if it is true. Many people have the Book of Mormon but have not received it. 4 – “Sincere heart, with real intent” I like to ask my classes if a sincere heart and real intent are different things. We generally agree that a sincere heart means you really want to know, but real intent means you “really intend” to do something about the answer you receive. James 1:5 admonishes those who lack wisdom to “ask of God,” but James 1:6 advises that seekers of wisdom must “ask in faith,” meaning they intend to act on the answer they receive. 8-17 – “deny not the gifts of God” Moroni knows that receiving an answer will be a gift of God, and explains other spiritual gifts available to humble seekers. A similar list of spiritual gifts appears in D&C 46:10-33. 24 – “now I speak unto all the ends of the earth” Moroni specifies his closing remarks are for all. 27 – “ye shall see me at the bar of God” Three of the four major writers of the Book of Mormon say that they will see us at the judgment. Nephi says, “you and I shall stand face to face before his bar; and ye shall know that I have been commanded of him to write these things…” (2 Nephi 33:11). Nephi’s brother Jacob says, “I bid you farewell, until I shall meet you before the pleasing bar of God…” (Jacob 6:13). In this verse Moroni says he was see us there, but he won’t be doing the talking, the Lord will. (The four major writers of the Book of Mormon are Nephi, Jacob, Mormon and Moroni). 27 – “Did I not declare my words unto you …?” Clearly, this question is directed to those who have had the opportunity to read the Book of Mormon. 30 – “Lay hold upon every good gift … touch not the evil gift” I’ve often used this verse in “standards night” firesides. Notice, that the Moroni does not say, “only touch the evil things in moderation.” No, he says, don’t get close, don’t even touch! “Balance” is a great word, but it doesn’t work for everything. When it comes to good and evil, we are not trying to be “balanced.” We are supposed to lay hold upon the good, “continually holding fast,” as Lehi might say, and were not even supposed to touch the evil things. 31 – “put on thy beautiful garments” This verse contains a few phrases of Isaiah. “Put on thy beautiful garments” means to put on the authority of the priesthood (see D&C 113:7-8). Of course, the highest use of the priesthood is in the temple. Notice also the phrases “strengthen thy stakes” and “enlarge thy borders.” Are you seeing what Isaiah is saying? Put on thy beautiful garments – Redeem the Dead. Moroni, using Isaiah’s phrases, articulated the threefold mission of the church. 32 – “Come unto Christ” Elder David A. Bednar observed that “The central and recurring theme of the Book of Mormon is the invitation for all to “come unto Christ, and be perfected in him” (“A Reservoir of Living Water,” CES Fireside, February 4, 2007). A few years ago, the theme for the Young Men and Young Women was “Come Unto Christ” from this verse, Moroni 10:32. I did a little research back then on the phrases “Come unto Christ,” and “Come Unto me” where Christ is speaking or being quoted. I found four occurrences of “Come unto Christ” and twenty-eight occurrences of “Come unto Me” in the standard works. Guess how many of the twenty-eight were in the Book of Mormon? Twenty-five. As Elder Bednar said, the “come unto Christ” invitation is a central and recurring theme of the Book of Mormon. 32 – “deny yourselves of all ungodliness” When I wrote my talk for the youth theme, I wondered what more could be said about this phrase. Then I had the thought, It doesn’t say the “Standards Police” will deny you of all ungodliness, but that you will deny yourselves! We are reminded of the question posed to Joseph Smith about how he governed all the people, and his reply was, “I teach them correct principles, and they govern themselves.” In the same way, our desire to be obedient comes from within. We deny ourselves of ungodliness. 33 – “then is his grace sufficient” One of my religion professors, Dr. Robert L. Millet used to say, “works are necessary, but not sufficient.” Indeed, good works are part of our theology, and while they are necessary, they are not sufficient. As King Benjamin said, “Are we not all beggars?” None of us, even with the good we do, can earn our way into heaven. No matter how much good we do, we would still be “unprofitable servants” (Mosiah 2:21). We must rely on the grace of Christ. 33 – “that ye become holy, without spot” The gospel of Jesus Christ is more than just knowing, and more than just doing, it is about becoming. They say, if you’re going to write a book or give a talk, here’s a good formula: Tell ‘em what you’re going to tell them, then tell them, then tell them what you’ve told ‘em. Moroni wrote the Title Page, the “tell ‘em what you’re going to tell them,” and the last page, the “tell ‘em what you’ve told ‘em.” So it shouldn’t surprise us that the Title Page and the last page both speak of Covenants, and of Christ, and of becoming spotless, or without spot. Take a look! This is an invitation from God. Whatever else you think you have going, cancel it, and accept. If you feel embarrassed or unworthy or inadequate, accept the invitation and just come. When you are coming to Christ, it means you are leaving your past behind and you don’t have to dwell in it any longer. Helen Keller said, “When you face the sun, the shadows of discouragement fall behind you.” To paraphrase, when you face the Son of God, the shadows of your past fall behind you too. If you feel too far away, remember that it’s not about the distance, it’s about your direction. In prison or in church, we all need Christ and he invites us all to be perfect in him. Every day, we make it clear which direction we are going. Some events take place on a certain day for time, but we can accept this invitation multiple times every day. Every time we utter a prayer, we’re coming to him. Every time we read the scriptures we’re coming to him. Every time we attend seminary we’re coming to him. Every time we attend church we’re coming to him. And the more we come to him, the more we become like him. And that’s what the gospel is all about – not just knowing, but doing; and not just doing, but becoming, “that when he shall appear, we shall be like him” (1 John 3:2, Moroni 7:48). May we become all the Jesus Christ wants us to become is my prayer in the name of Jesus Christ, amen. There is no way to adequately thank you for this and all the study, preparation, and work you put into this!! I am extremely grateful for how you are enhancing my scripture study and understanding through the Spirit of the Lord!! I hope you will continue through the new year 2017!! What a blessing! !